After losing steam for a few days, crude prices are back above $47 after closing last night at $46.34. Prices are currently $47.18, a gain of 1.81% this morning. Refined products had a much harder time yesterday. While crude prices picked up a 1.6% gain over the course of the day, diesel and gasoline added just 22 points and 13 points, respectively, hardly moving above their opening prices. Today, refined products are picking up steam, with diesel rising 1.4% and gasoline rising .7% since closing yesterday. Still refined products are lagging behind crude oil’s 1.8% gain. Market-moving news has been slow this morning. The API is slated to announce its projected inventory numbers this afternoon. 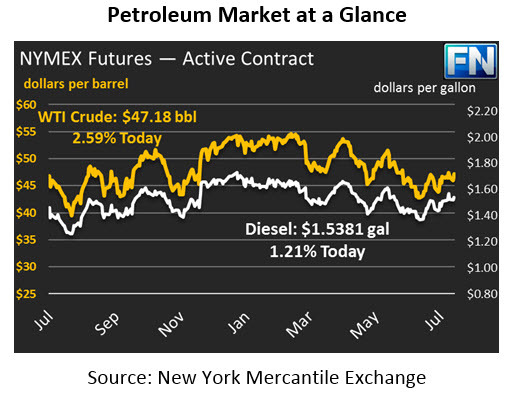 Markets are expecting across-the-board stock draws for crude and refined products. Bloomberg estimates that crude will see a 3.4 MMbbls drawdown, accompanied by 2.1 MMbbl and 669 kbbl draws for gasoline and diesel, respectively. Tomorrow, we’ll evaluate whether those estimates are correct. Yesterday Bloomberg produced a thoughtful analysis on the hidden strength in physical markets. While WTI and Brent crude prices are the most widely evaluated prices, they tend to be buoyed by hedge funds and speculators, caught up in market sentiment. Less popular indexes, ranging from Venezuela’s Tia Juana Light to Vietnam’s Bunga Kekwa to Middle Eastern Basrah Heavy, are all trading much higher than usual relative to WTI and Brent indexes. Subject to less speculation, these markets make good indicators of actual day-to-day supply and demand. Tighter differentials between those products and major indexes like WTI and Brent indicate that supply is becoming tighter. Perhaps we’ve all been looking at the wrong prices when evaluating the OPEC deal; these markets all appear to be pointing towards a tightening supply market. It appears the Shale Boom is starting to lose steam once again. Halliburton, a major oil field services firm, forewarned yesterday that oilfield exploration may be slowing. Hours later, exploration company Anadarko Petroleum announced that they would be cutting their exploration budget in response to Q2 losses and declining oil prices. Mixed with 2 weeks of rig count losses in July, and it appears that U.S. oil production may finally be feeling the effects of low oil prices.